German tuning house Hamann isn't known for producing boring vehicles, and its latest projected, dubbed the Victory II, is a prime example. Based off the Lamborghini Gallardo LP560-4, the Victory II features a completely new look thanks to all new body panels, functional roof inlet, rear wing and 20-inch Hamann wheels. Inside, the car gets new carbon fiber sport seats and custom upholstery. With the LP560-4 already producing 552 bhp and 398 lb-ft torque, Hamann decided to do only minor modifications to the 5.2L V10. New engine programming results in 20 more horsepower and an additional 26 lb-ft, resulting in a new top speed of 204 mph. You can read more about the Hamann Victory II in the press release after the jump, or browse through the images from its studio photoshoot in the gallery below. 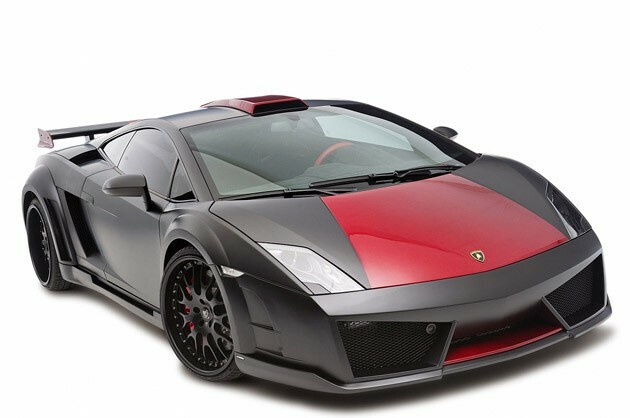 Hamann Victory II is Lamborghini's Gallardo gone wild originally appeared on Autoblog on Thu, 23 Dec 2010 17:30:00 EST. Please see our terms for use of feeds. nice! but a roof scoop? Wait...seems like it's not connected to anything. But I have seen mid engined, high powered cars have a hood scoop that feeds into the engine bay. exactly! but im thinking the air forces itself through the vents above the engine and come out the back..? when it comes to $$$$$$$$$$$$$$$$$$$$expensive cars like this, i think that company knows what they're doing. rear or mid engine they need to get the air some how. look wise the hood scoop isn't really appealing but engineering wise its a great way to get a lot of air to the engine when you have a mid-engine car. THIS! the motorized side scoops were better.